Creative Boro Mending — SOLD OUT! Boro means ragged, tattered and patched textile garments. This workshop allows participants to discover new life for well loved clothing. Up-cycle your favourite garments with visible patching and sashiko stitches. 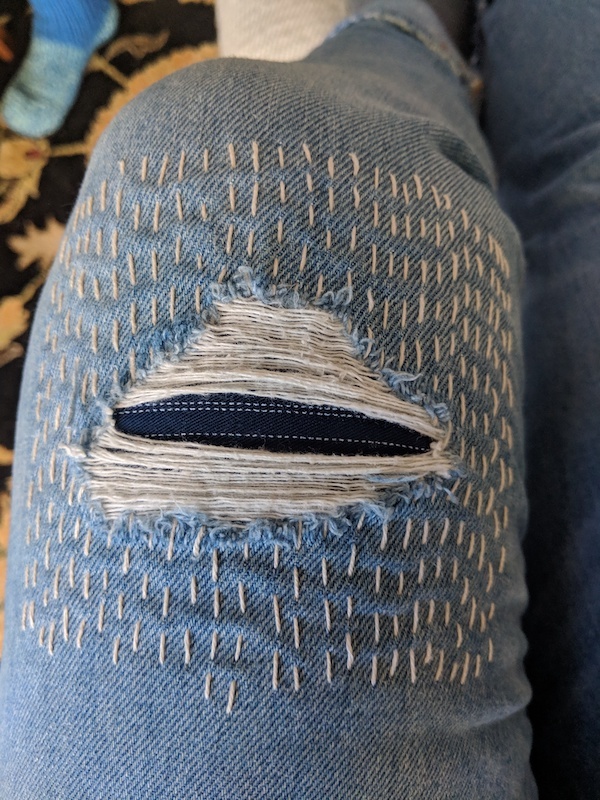 Elbow patches, torn knees, or worn out seats are no match for this simple yet effective technique. Your mending project will inject personality and uniqueness while extending the useful life of clothing. Fabric for patching, needles and threads will be provided. Irene Fraleigh is new to the Gabriola craft scene. She has been crafting for over 50 years and has taught a variety of workshops for all ages. 13+ | $50 | 15 max. Participants take home: a mending project of their own, needles and threads and an info package on boro techniques.